Put oats and water in a large pot and soak overnight. This is not necessary but it will make the oats cook a lot quicker in the morning. I don’t know about you, but my children are not very patient about waiting for breakfast. In the morning, stir in the pumpkin, salt, vanilla and spices. Bring the mixture to a boil over medium heat. 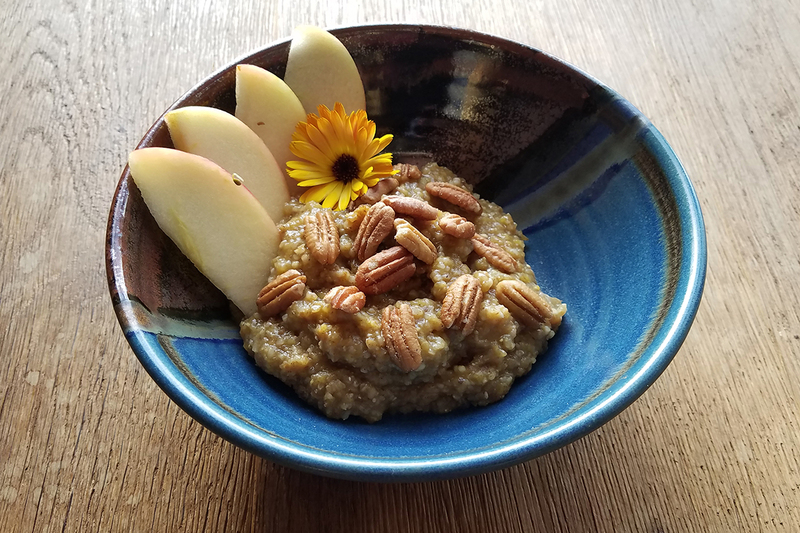 Reduce the heat and simmer, stirring frequently, until the oats are cooked and the oatmeal is thickened, about 15-20 minutes. Stir in maple syrup and pecans and allow to cool slightly. This is one of Findlay’s favorite breakfasts and with a little butter and fresh milk it is divine. The first cookbook from homesteaders and co-stars of Discovery’s Alaska: The Last Frontier Eve and Eivin Kilcher features appealing recipes for anyone looking to live more sustainably, healthfully, and independently, regardless of where and what they call home. Over the years, Eve has collected recipes from all over. Her stepmother, Eva, gave her a recipe journal with family recipes that have been passed down to from generation to generation. Fill out your information below to be notifed when Eve publishes a new recipe from her family journal!